Irvine Voices and Civic Action! Last month’s front-page story — “Trump Agenda Threatens to Hurt Thousands In Irvine” — focused on the specific effects that President Trump’s proposed federal policies would have on Irvine residents. The article itself and the accompanying Irvine Community Poll elicited a strong response among our readers. 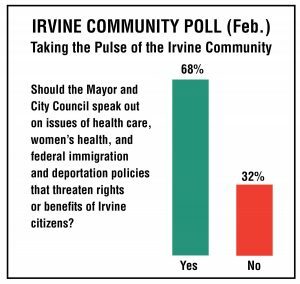 Here (below) is the Irvine Community Poll question we posed; the results of the poll; and a representative sampling of the letters and comments we’ve received. The Mayor and City Council should weigh-in when the Trump agenda adversely affects our community. The Irvine City Council should invite the members of Congress whose districts include Irvine to appear at certain Council meetings to explain how federal policies will affect the cities in their constituencies. I just read that Obamacare includes a rule requiring chain restaurants, movie theaters, etc. to list calories on menus. I have changed my eating habits when I eat out because of this rule. If Obamacare is repealed like Trump and the Republicans want, it will be a step backward. We need to know what is in the food we are eating so we can make informed decisions affecting our health. One responsibility of elected community officials is to provide leadership. It is their responsibility to speak out in the interest of their constituents. I depend on their representation and advocacy. 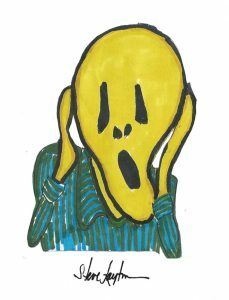 I am an independent without political affiliation, and do not understand why so many “experts” are racing out ahead of the new Trump administration, speculating on what is going to happen. Why can’t we give the new team a chance before we comment or judge. in the most fundamental way. Whenever a significant number of residents here in Irvine have their rights threatened, our elected officials should speak up on their behalf. I certainly think that our Mayor and City Council should keep an open dialogue with their constituents to find out what they think and feel, and to respond in ways that will have positive effects for all the citizens of Irvine. Yes, speak up for our community. Get over it. Hillary would have been just as bad, but she wouldn’t have been as open as Trump about it. Local officials should keep the focus at home, and instead figure out how to halt over-development and overcrowding in Irvine. Stand up and defend American values. Stand up and defend equality, civil rights, and all the rights given by the Constitution. This is the land of the free and the home of the brave. This is the land of the American Dream and pursuit of happiness. Our Mayor and Council should hold a meeting, and then speak up for the people, as they are supposed to do. It’s no surprise that some of our Irvine elected officials have not responded to Donald Trump’s atrocities. I participated in the Women’s March; and I support Planned Parenthood, immigration rights, and LGBT rights. Our elected officials in Irvine should contact Donald Trump to tell him how his policies, actions and Cabinet appointees are making America poor, divisive, and sick. Stop scaring the people. Trump is great. He is doing what should have been done years ago. He is not a ditz. He is a man who speaks his mind — that is why he is so successful. I find it hypocritical that the same people who are rabidly anti-growth are at the same time against cutting down on illegal immigration, cutting H1B visas that favor foreigners over U.S. citizens, and limiting immigration from cultures and countries that don’t share our values. It is because of unchecked immigration that we must build, build and build even more. Federal policies should reflect the views of local governments and local representatives. The current President should remember that it is his privilege to represent all citizens of the United States regardless of race, religion or creed. Not just his rich friends. Yes, the Mayor and City Council should speak out on issues that threaten the rights of Irvine citizens. How can our local elected officials NOT speak out on issues and policies that affect the health and welfare of all our citizens? Since the policies and agenda being put forth by our nation’s current administration single out and threaten groups of Irvine residents, we must speak out against such bigotry and potential social and economic harm. Not only will Irvine be impacted by the President’s executive orders, but almost all cities in California. Our Mayor and Councilmembers have a duty to stand up for their citizenry. I think the City Council of Irvine should write letters to President Trump and to Congresswoman Mimi Walters, and Senators Dianne Feinstein and Kamala Harris, stating opposition to repealing the Affordable Care Act; opposition to de-funding Planned Parenthood and women’s health programs; and opposition to the President’s immigration and deportation policies. I further believe that this entire issue of City Council communications and advocacy should be placed on the City Council agenda and fully discussed in the public forum. This way the public can get to know the positions of the Mayor and Councilmembers. Trump is a vulgar bully; a petulant child, and an embarrassment to this country. Our Councilmembers should go on record as opposing his hateful policies. 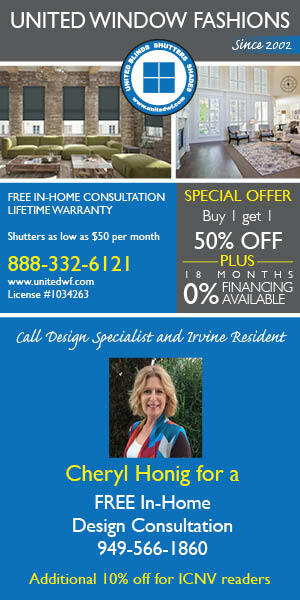 Irvine has a reputation as a welcoming, family-oriented community. That reputation will be destroyed if Irvine is governed by people who believe and act as Trump does. EVERY governmental agency in California, regardless of how small, should REJECT the Trump agenda. We are better citizens than those who coronated the completely unqualified developer as celebrity-in-chief. One would hope that our City Council would rise above their petty personal political views and act in the best interests of Irvine citizens. All politics is local. Yes, the Mayor and City Council should speak out on policies that threaten the rights and benefits of Irvine citizens. Everyone should be speaking out. We all need to protect our Democracy and our citizens. Your front-page article [Trump Agenda Threatens to Hurt Thousands in Irvine] is very misleading. Articles like this are why people are getting so worried and fearful. Free speech is a right of every American! It is not only our right but our responsibility to speak out against policies that are discriminatory or can forever damage our values as Americans and our rights as citizens. Our representatives must speak for us! Stop getting involved in Trump-bashing. It’s so sad to see you are on the Trump-bashing train. Stop harboring illegals!! Irvine used to be the safest city in the U.S., but no more. It’s way too early say whether or not President Trump will be successful in representing the people of the United States of America. Giving him a chance would be wiser than protesting. Protesting is NOT an answer. Patience is golden. Let’s wait and see what Trump does. I’ve had 37 safe years in this wonderful country. America hated South Africa when my family came here. Initially visitors, we later converted to Green Card status and finally we became American citizens. We have contributed intellectually, socially, and perhaps in this dark time, morally to American society. I was so shaken by President Trump’s immigration order, that my husband and I went with flowers to the local Mosque on Saturday night to voice our solidarity and outrage at what is happening. We attended a synagogue meeting about the hatred that is flooding social media, aimed at the Muslim and Jewish communities. President Trump has given permission for the “dark side” of America to speak out. Anyone who is “different” can be cast in the role of “enemy.” That “playbook” is historically familiar and horrifying. This amazing country is a Democracy. This IS the wonder of America — we can speak out against hate crimes, laws we disagree with, and discrimination. We have Freedom of Speech. We must exercise that freedom. As my Representative in Congress, I expect you to be my voice for a humane and just America. Letters to the editor are welcome. Please include your name and ZIP code. Letters for publication must be addressed to Editor, 4199 Campus Drive, Suite 550, Irvine, CA 92612 or email Editor@IrvineCommunityNews.org. Letters may be edited for publication. Unpublished letters will not be acknowledged or returned.